We stock dual point stand alone gas sensors, manufactured by Opera Inc. If you require another type of specialized unit, just let us know and we can order it in. 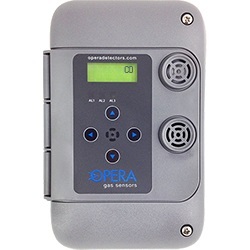 Opera manufactures fixed gas monitoring systems used in commercial and industrial buildings to measure and control toxic gases.